First summer - getting huge lift from her centerboard. When Pam and I first started sailing together, it was in the evening with no other boats around. With light to medium flat-water conditions, it was straight-line boatspeed stuff. She was new to Lasers but a quick leaner learner. And for me it was really frustrating. Or should I say humbling. You see, she was so fast that I had to keep asking her to drag her leg in the water to slow down. And no, that's not what you do when racing. So with this much speed in those conditions, why to this day does she not consider herself competitive? The answer is simple - intimidation. 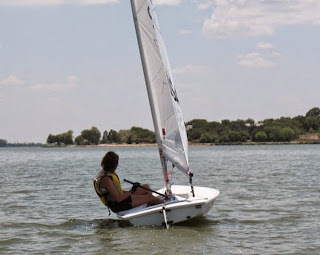 Sometimes it's sailing with two dozen kids who are experienced way beyond their years, sometimes it's the weather, but most of the time it's knowing that the Laser/Torch is the most competitive dinghy in the world. You don't win races, you lose races. When you screw up, absolutely no one waits for you. It's competition at its purest. Pam: The intimidation is from the boat and the wind and the people who know what they're doing. Doug takes a nap between races when it's blowing 20+. I'm white knuckled between races trying to maintain control, not run into people and stay upright. I'm getting better at it all the time. I do tend to want to stay away from ultra aggressive sailors though. We're on the course for very different reasons. Here's a typical race for the Pam's of the world: second row start, no clear air, no real game plan, and no hope of being anywhere near the front. So with the encouragement of Tillerman, Keep Reaching, and others, we're going to share more about the rules of thumb that Pam and I talk about. 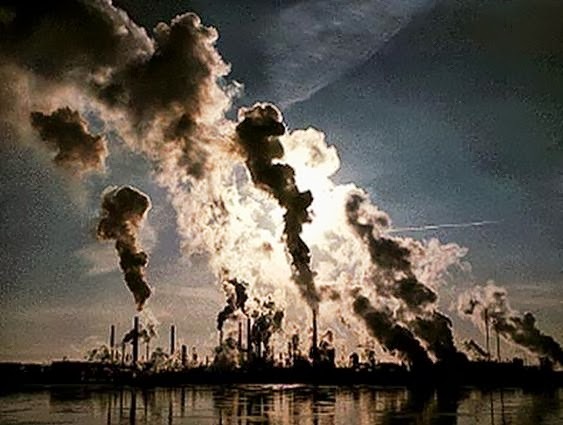 The first and perhaps most important rule is pretty obvious - clear air. Sailing in dirty air is like sailing a Radial when everyone else is sailing a full-rig. Not fun. And the most important part of the race for getting clear air is, of course, the start. My definition of a good start is not being at the correct end of the line, or being on a lift, or even going the right way. For me, it's having clear air 10 seconds after the gun. This means that starting in the second row at the boat and being able to tack is still a good start. Starting near a favored pin end but being boxed in is, for me, a much worse start. 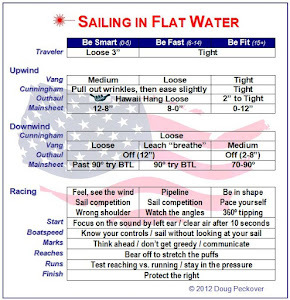 Pam: For me that means knowing which side of the line is favored and which side of the course is favored and where the bulk of the experienced sailors are going to be at the start and planning to be somewhere else. Suppose the pin (or boat) is favored by 10 boat lengths. If you start at the other end of the line in clear air, you're just 10 boat lengths behind the person who won the start (assuming they're not boxed in) and you've got the rest of the race to catch up. In a good fleet, that's better than 80% of all other competitors. Not such a bad start! So, don't be intimidated on the starting line - just go for clear air. Pam: I get tripped up more often than not when trying to be on the start line so I hang back, get a little speed going and find the last minute holes without a crowd. It works much better than fighting for a place on the front row and getting pushed over. So, where's the clear air? There's an interesting phenomenon in sailing - on the first beat the boats tend to go left and on the other beats the boats tend to go right. So, clear air is right in the first beat and left in the others. But I don't mean hard right or left, but just far enough to get, you guessed it, clear air. You can then tack and go with the leaders, play the shifts, look at the wind patterns, etc. We'll look at each of these later. For now, just think about your recent races and what you could have done to get clear air right after the start. Now here's something for more experienced sailors: it's tempting to start beside a beginner, and even call these people "marshmallows." But your great start pretty much assures a bad start for someone trying to learn our sport. If you must be selective, pick on someone of equal skill to hone your skills. Or do what I do which is ignore who you start beside and sail your hardest, while still trying to encourage others whenever you can. That's way more important than just winning. Pam: And just remember, if you must screw up my start and Doug is on the course, plan to be wearing him for the rest of the day. Excellent post and continuation of the series - this is really dynamite - I see an E-book or something coming. 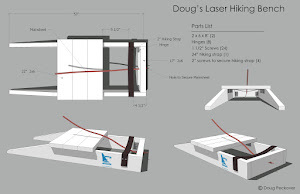 By the way - an very interesting typo in the first line - "She was new to Lasers but a quick leaner. " I guess you are subconsciously telling us Pam is very good at hiking. LOL KR - you beat me to the snarky comment about the "quick leaner." But seriously, this is great stuff. 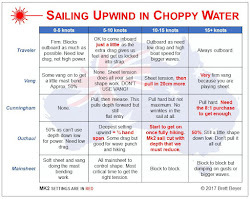 Exactly the kind of thing that 80% of sailors need to know, and way more useful to us than the usual starting advice about being at the favored end and using your line sights. And that "go right young man" advice can be amazingly effective. Get clear air by going right at the start, throw in some luck with a helpful shift or two, and you can be leading the fleet by the end of the beat. I've done it. Well, I've done it at least twice in 30 years! Keep it coming you two. A great follow up to this post would be some diagrams showing "what is a good lane", or "where and how big are the wind shadows created by a laser in various wind conditions".